Historically, Kettler have been known as one of the few brands in the market that manufacture products in Europe (Germany) and their core range is considered among the best out there, but at premium price points. 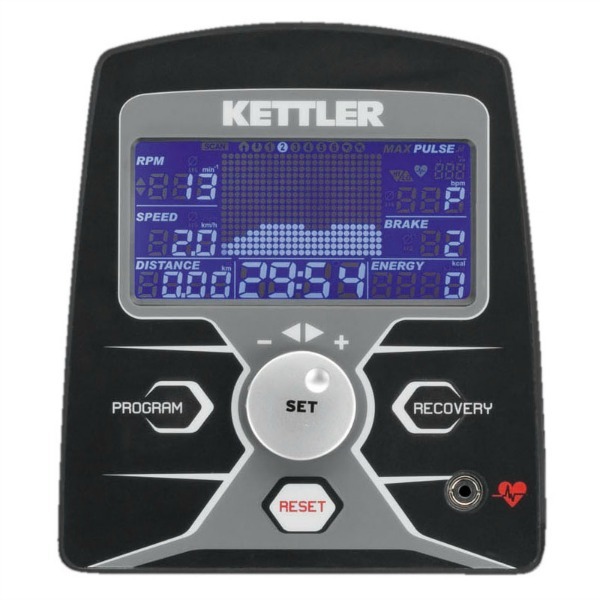 In 2010, Kettler launched their first cross trainer that was designed in Germany, but manufactured in the far east in order to compete in the more aggressive price points. The Rivo P Advantage is the 2nd generation, and the follow-up to, the highly successful original Rivo P. So, is it any good? The most important characteristic of a cross trainer is the feel and smoothness of the stride action and we were seriously impressed with the Rivo P Advantage! The motion is fluid and natural thanks to a combination of the 14kg flywheel, a decent 40cm (16 inch) stride length and high-quality bearings used in the construction of this elliptical. This 16″ stride should be a good fit for most people, though if you’re over 6ft it’s possible you may find it a little restrictive. An extra few centimetres may not sound like much in comparison to machines with a shorter 14″ or 15″ stride, but it really makes a difference to the feel of your workout – and the better it feels, the more you’re likely to use it so these few extra centimetres really are a matter of consequence. We can confirm that Rivo P Advantage is extremely easy to use in manual mode: you just jump on the machine, start exercising and adjust the resistance using the rotating dial in the centre of the console. For some reason, the word “brake” is used on the console, rather than “resistance”, but there are 10 levels that can be selected and we can confirm that at the higher settings, the resistance is high enough to provide a proper challenge. In terms of heart rate measurement, there are a couple of options. Firstly, there’s a pair of pulse grip sensors on the static handlebars, which provide a convenient means of getting a quick heart rate measurement. The second option is the built-in wireless POLAR heart rate receiver which gives a significantly more accurate pulse reading than the hand grip sensors. Though this model doesn’t come with a chest belt transmitter they’re relatively inexpensive and are worth every penny (nay, essential) if you plan on performing heart rate controlled workouts. To use the chest belt simply put it on, get on the cross trainer and start working out. It really couldn’t be any easier. This method of measuring heart rate also has the advantage over pulse grip sensors because you keep your hands on the moving uprights and get the benefit of the upper body exercise that should come with using an elliptical trainer. The Rivo P advantage has 6 pre-set programmes to provide workout variety. In addition to this, there is a target programme mode where you can specify target time, distance or calories for the exercise session and once started, the computer counts down from the target level. We’re very pleased to see heart rate control functionality on this elliptical trainer. There are two HRC programmes: One simply allows you to enter a target a heart rate in beats per minute and the other enables the user to enter the age and choose to exercise at 65% of their automatically calculated maximum heart rate for fat burning, 75% for fitness training or to actually specify an individual percentage. With the target heart rate set, the cross trainer automatically adjusts the resistance levels in order to keep you close to exercising at your target heart rate! Finally, this elliptical trainer has a recovery test function. After an exercise session (with your heart rate elevated), you press the recovery test button on the console and grab the pulse grips on the handlebar for one minute (or use the optional chest strap). The computer monitors the rate at which your heart rate is returning to its resting level and based on that provides a fitness rating. We think a machine having a recovery / fitness test built in is extremely useful in providing motivation by actually enabling the user to see improvements in their fitness levels over a period of time. It really does help motivate you when you see that your hard work is making a difference. When you know all your effort is paying off, it’s much easier to keep going and motivate yourself to get on again the next time! The new Rivo P Advantage is smooth, quiet and has enough features and variable programmes to keep things interesting and prevent boredom. It also now comes in a new sleek black finish which makes it look modern and benefits from Kettler’s excellent 3 year parts and labour warranty for peace of mind. The Kettler Rivo P Advantage is not currently available from any retailers we're aware of in the UK. The Kettler Rivo P Advantage is a very solid machine that looks good, has a nice stride action and lots of functionality. Being a Kettler, it has an impressive 3 year warranty as well. 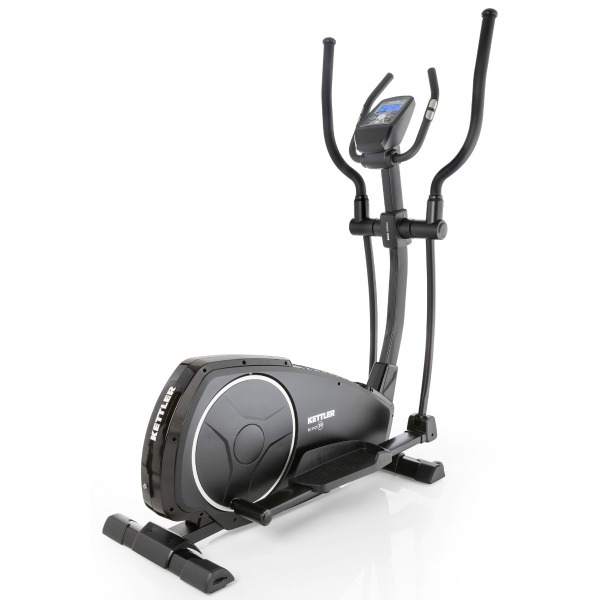 If you like the Kettler Rivo P we also think you'll like the DKN XC-140i which delivers bio-mechanically correct action, is made from quality components and is compatible with the DKN Motion workout app which is a great extra feature for exercisers. The console is quite compact in size and for a cross trainer in this sort of price point, there is a really good amount of information that is made available. There is one main area in the middle that is used for displaying programme profiles other pertinent information when using programmes and there are 7 windows that display RPM, speed, distance, exercise time, calories, resistance (brake) and heart rate continuously. The buttons / knob on the console are simple and clear to use and the Rivo P does manage to pack a lot of functionality into a small console - whilst most people wouldn't use half the functionality of the console, it's nice to know that it's all there!